The Redneck Horn features the following messages.. Slow down dumb a$$ Wal-mart's open all night! Hey Hognuts, Who taught you how to drive? What the hell was that maneuver? What race are you in Shithead? Drivers License, You ought to get one a$$wipe! Put the cell phone down Dickhead. Tired of rude drivers and road-hogs cutting you off, changing lanes without signaling and generally acting like jerks? Looking for a safe and effective way to vent your frustrations? Let your redneck friend handle them for you. 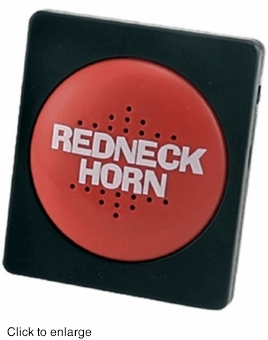 Simply attach our Redneck Horn to your dash and when you feel the need to scream, just press the big red button. Out comes one of ten “Redneck Insults” in a loud redneck accent sure to make you laugh and feel better fast. Perfect Gift for the Redneck we all know. Bill Engvall with the Blue Collar Comedy Tour says "It's the funniest thing I've seen in a long time and is going on the dashboard of my truck"